The USPTO invalidated Apple's U.S. Patent No. 7,469,381 in October of last year, including rejections on claim 19, which was successfully leveraged against a number of Samsung products in the companies' high-profile California trial. 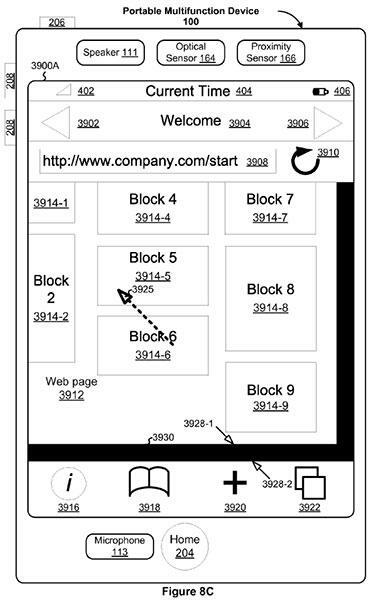 Apple's so-called "rubber-banding" or scroll bounce-back patent deals with the iOS user interface feature that lets users know when they have reached the bottom of a scrollable page. An ex parte examination was requested for the property in May, with the USPTO's first Office action in October finding two cases of prior art against the patent. As noted by FOSS Patents' Florian Mueller, Apple has made some headway since the initial action, as the USPTO's Central Reexamination Unit confirmed claims 14, 17 and 18 of the '381 patent. However, the remaining 17 claims, including the important claim-in-suit in the Apple v. Samsung court trial, were once more rejected. Mueller says Apple and the anonymous challenger that filed the ex parte request have two months in which to respond to the final rejection. The word "final" sounds more definitive than it really is, he writes, pointing out the Central Reexamination Unit sometimes reconsiders these findings. If the USPTO doesn't, an appeal can also be lodged to the Patent Trial and Appeal Board, which will make its own final decision. If all else fails, Apple can then take the PTAB's decision up to the U.S. Court of Appeal for the Federal Circuit. Mueller believes it will be years before a resolution is found regarding the validity of Apple's patent. To prove that claim 19 is valid, the Cupertino company must prove to the patent office, or the appeals court, that the IP was both new and its claimed inventive step in regard to the prior art is tenable. Samsung could be bringing the final Office action development to the court in a bid to curry favor with Apple v. Samsung presiding Judge Lucy Koh as the post-trial processdings continue. Apple wants to hold a new trial for damages related to 14 Samsung products, while the Asian tech giant is seeking a partial final judgment so that it can appeal the ruling with the Federal Circuit. If the invalidation of claim 19 is carried in the Federal Circuit, a completely new trial for all products at issue would be needed because the jury awarded damages per-product, not per-patent.